Blogger is updating itself day by day to make it more user friendly and useful platform for all kind of audience. So Blogger has recently (on 15th of May 2013) launched official contact form. Most of us don't know it is available on Blogger gadget section but it is developed by third party developer not by the Blogger team. Whatever it is very neat and clean in GUI, behavior and very responsive i.e. loads quickly without pampering you like other third party contact forms. It can be a good choice for those who want simple contact form for their Blogger blog. This contact form have three fields - Name, Email and Message with a Send button. Email and Message fields are mandatory. 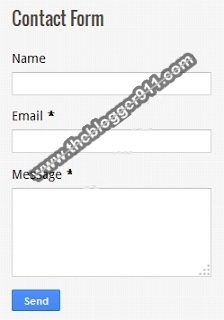 This simple official contact form can be placed in Blogger sidebar and it looks very nice. We are giving a preview of this contact form hereunder to visualize this. 3. If some one contact you through this contact form email will be send to all admins of the blog (In case of Multi-Admin blog) on their email addresses. How to add this official contact form your blog? 2. Click on "Add a Gadget"
4. Now click on "Contact Form New!" 5. Gadget will ask for custom title for contact form. Default value is "Contact form" you can change it anytime. 6. Once you are done you can press "Save button"
7. You can drag this gadget to any custom location where you want to display on your blog. I hope you'll install this contact form on your blog and find it more useful.